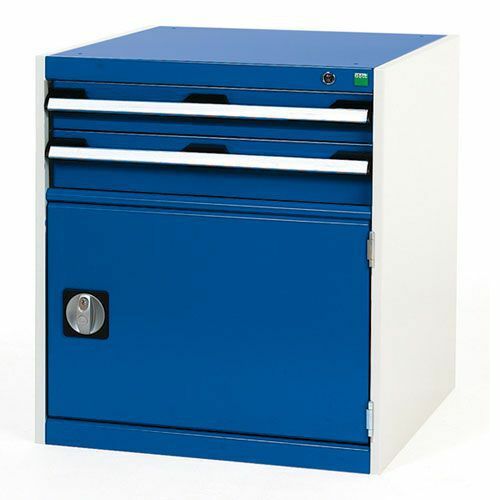 A perfo door liner allows tidy and flexible storage of tools, small parts and consumables. Fully lockable, ensuring security and safety. Both models have 2 drawers with heights of 75mm & 100mm. All drawers have a 100% extension roller bearing slide and scuff-resistant galvanised pans, for smooth yet frequent use. Smart, powder coated finish is both resilient and professional. All cabinets are fitted with a drawer blocking mechanism to prevent more than one drawer from being opened at a time. The reinforced steel housing has a UDL capacity of 1 tonne. Drawers have a standard UDL of 75 kg. Optional worktops and top trays available - please see accessories. Bott Cubio combination cabinet, with perfo door, shelf and multiple drawers WxD 650x650mm.